Save up to 82%, why not try? 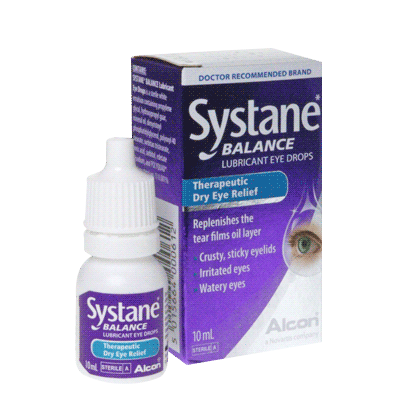 Replenish the moisture in your eyes with Systane Balance eye drops, from leading manufacturers Alcon & Ciba Vision. These eye drops have been designed to provide effective relief from dry eyes. Dryness of the eye can be caused by several factors such as air-conditioning and prolonged screen use, which can trigger burning and irritation as a result of this. Systane Balance works to lock and retain natural moisture in your eyes, achieving long-lasting relief from morning till night. Systane Balance supports your own natural tears by restoring the lipid layer and is designed to reinforce all 3 layers of the tears film. You can rely on this restorative formula to instantly lubricate and rehydrate your eyes. The eye drops are available in a handy 10ml bottle. For use, simply shake well and apply 1-2 drops as needed. Enjoy proven protection from dry eyes with our wide range of eye care products to cater to your needs at FeelGoodContacts.ie.